There is a small spur directly to the north of Picacho Peak, and between that small spur and Picacho Peak there is a small saddle. Calloway Trail starts from Barrett Loop, sharing a trailhead with the much more ambitious Hunter Loop, and climbs up to this saddle. From here there is a view of Picacho Peak RV Park and I-10 to the southeast. Drive on the Barrett Loop past Children's Cave Trail, past the green water tanks, and park near the Hunter Trail trailhead. There are spots here for about fifteen vehicles. 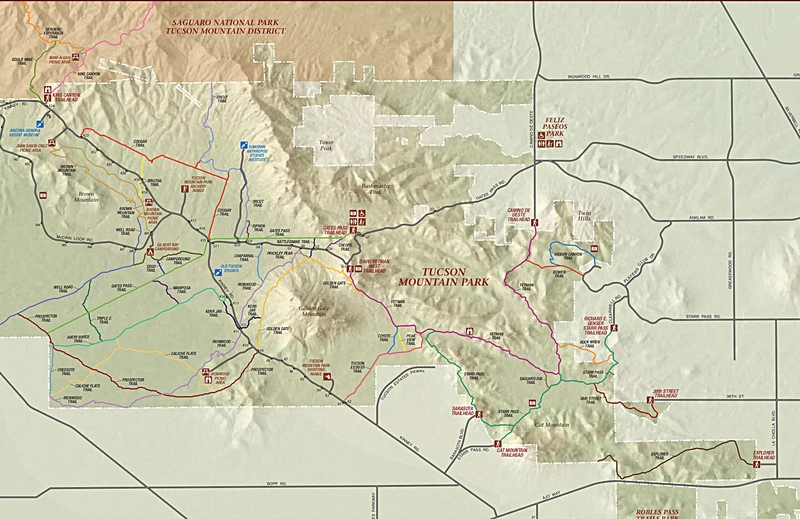 If these are full you can always circle back and park either near Children's Cave or on the Harrington Loop and walk some of the unnamed connecting trails in a general southeastern (towards Picacho Peak) direction to start. Once at the trailhead follow the signs for Calloway (not Hunter, unless you plan on bagging Picacho Peak). The path immediately drops down into a wash and climbs up the other sign and encounters a few unnamed trails that head left towards Nature Trail and Harrington Loop. There are a lot of unnamed trails in this park. Continue along Calloway, as it stays above the eastern bank of that wash you first crossed, slowly passing by the tall spur on the left. Just before 0.2 miles the trail begins to curve east and steepens along some switchbacks, with some rocky sections that may have wash-out damage around the stud-enforced stairs. Picacho Peak dominates the view ahead, especially the steep northern cliffs. Eventually things begin to level out near the top of the saddle and the last few hundred yards becomes a pleasant, almost too easy, stroll over smooth gravel lined with small rocks. At the saddle proper there is a nice wooden bench waiting for you. Return the way you came in. Between Phoenix and Tucson on Interstate 10 Exit 219. 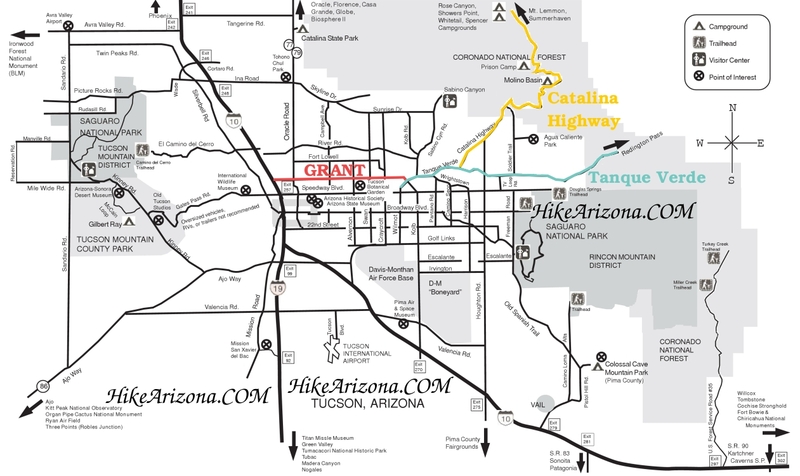 Follow the signs to Picacho State Park. Turn left about 1/2 miles past pay station and park on the Barrett Loop.